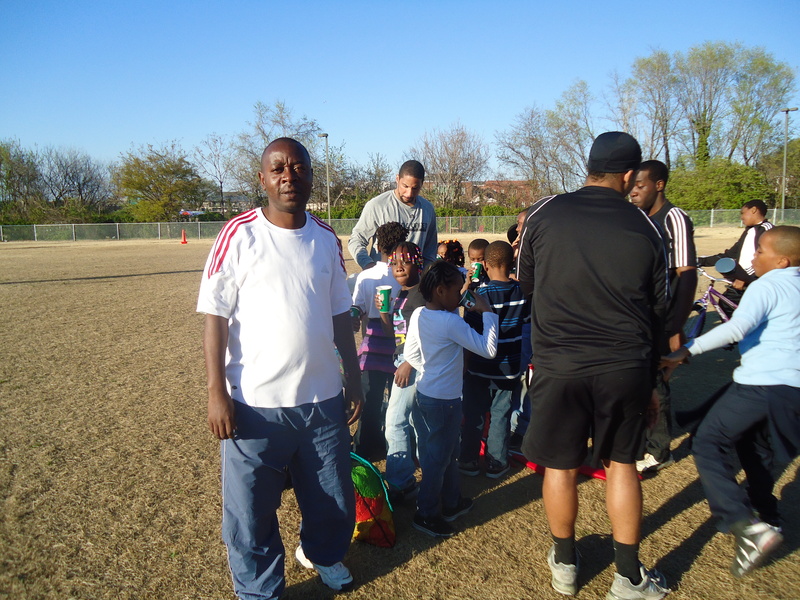 Tanzanian Coach Nicholaus Achimpota trains in the USA with Coaches across Continents as part of the Hat-Trick Initiative. April 8th, 2011. Coach Nicholaus Achimpota is in Washington DC this week as part of the Coaches across Continents Hat-Trick Initiative program. Nicholaus, the former sports officer at the Kigoma Municipal and current sports officer in Chamwino was the first person to request Coaches across Continents for Kigoma program back in 2008. Nicholaus is attending the Urban Soccer Collaborative Convention with Coaches across Continents. On Day 1, Nicholaus was part of the Soccer for Nutrition/Fighting Obesity in the USA session, led by Coaches across Continents founder, Nick Gates and discussed how food was an incentive for children in Tanzania to attend Soccer for Development programs. Unlike the USA where childhood obesity effects 1 in 3 children, in Tanzania the problem is a lack of food. The photo (above) shows Nicholaus in discussion with Panos from Streetfootballworld and Zola from Urban Soccer Collaboration. At the end of the day, Nicholaus met with Olympian Dominic Dawes to talk more about childhood obesity and the USA governments program, Let’s Move. On Day 2 Nicholaus was able to attend sessions on Evading Gangs: Using Soccer to Teach Life Skills and Reduce Youth Violence and Innovative Coaching: New Strategies to Reach all Athletes and a late session on Youth Led Projects around the World. On Day 3 the sessions included Signature Events: Creative and Innovative Fundraising, In Class: Promoting School Attendance and Academic Success through Soccer. Nicholaus also attended a coaching session with Coaches across Continents coach Kelsey Moore at her DC program and a late Youth Clinic at the Georgetown Soccer Fields run by Nick Gates with Urban Soccer Collaborative. On Day 4 Nicholaus attended meetings with State Representatives on Capitol Hill to discuss the Coaches across Continents national and international programs. “I learned many things in the USA. It has given me new experiences of different community programs and I will use this new information to help build our youth development through sports programs in Tanzania. 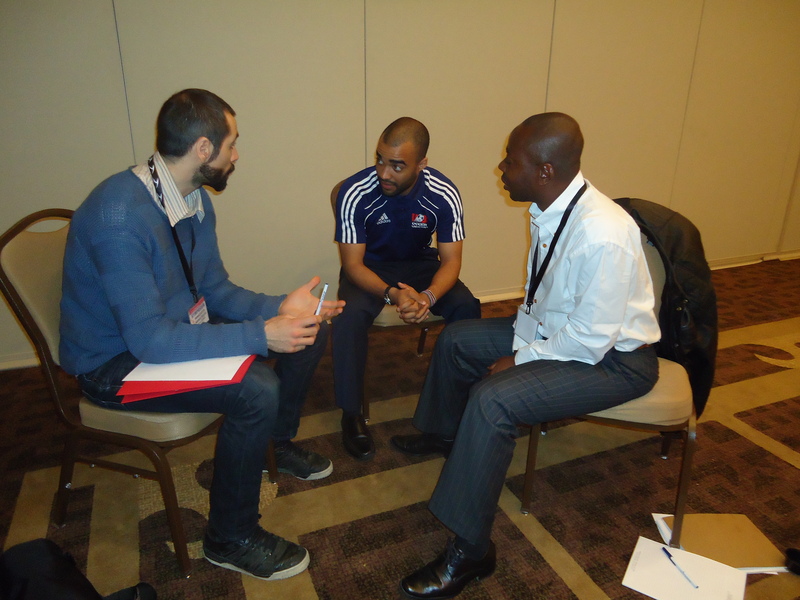 Thank you to Coaches across Continents and Urban Soccer Collaboration”. Nicholuas Achimpota, Coaches across Continents, Tanzania. Previous: A record number of partner requests in 2011. So glad that Nicho came to the USA. He is a wonderful coach and wonderful person! I am sure he gave as much as he got while visiting Washington DC. Congrats to CaC on their ongoing success!